In one of my college English classes,we once had a discussion about the purpose of art. Our discussion boiled down to two camps: the aesthetic and the didactic. The aesthetic camp believed in “art for art’s sake”; in other words, art needs no justification. It just is. Or something like that. I didn’t really buy it. On the other side, there was the didactic camp. The didactic camp believed that the point of art was to teach something. Art needed a purpose, a worthy message. Now, even those in the didactic camp admitted that art shouldn’t beat you over the head with that message, and that preachy art is generally not good art. But at the same time, they argued that art that wasn’t trying to say something was pointless. I am a practical person at heart; thus, I fell into the didactic camp. And yet, I’m often torn between these camps when I read books to my kids. Even as a believer in didacticism, some books seem over the top to me. For example, take this Berenstain Bears book we checked out a few weeks ago: it was called The Trouble with Secrets. Now, if you don’t have young kids, you might not know this about the Berenstain Bears, but they have seen the light. I don’t remember the childhood BB stories I read being overtly Christian, but they sure are now. Well, some of them are. And others are just regular stories extolling good behavior. Usually, the overtly Christian ones announce it to you in the title. For example, we currently own a collection called, The Berenstain Bears Show God’s Love. I love it. It has stories about loving your neighbor and about prayer, and the kids love them. But this book about secrets didn’t seem religious; indeed, neither the title nor the plot really lent themselves to religious application. Instead, it was just a simple story about the trickiness of friendship. It was told from the perspective of Brother and Sister Bear’s friends, who were miffed that Brother and Sister were keeping a secret from them. Thus, they followed the siblings to find out their secret. Fair enough. Throughout this narrative, however, the authors kept dropping non sequiturs about God, from out of nowhere. It has been a few weeks since I read it, but if I recall, the comments were about God not wanting us to have secrets, or something (which, by the way, is not in the Bible). Regardless, it seemed like the parts about God were superfluous, that they were shoe-horned into the plot without really fitting. In a way, it seemed like the authors were playing the God card. And I didn’t like it. I think I was also put off by the “sneak-attack” element of the book’s Christian content. Nothing about the book suggested that it was going to be religious; it just seemed like an ordinary Early Reader in a public library that services a religiously diverse area. And then midway through the book, the reader is subjected to strained religious applications. To be honest, I think the seeming subterfuge put me off as much as the heavy-handedness of the theme. In short, I found The Trouble with Secrets to be too preachy, too didactic. 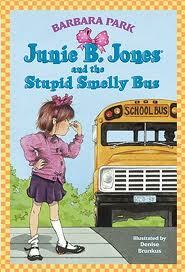 On the other end of that spectrum, we have the Junie B. Jones books. I have heard wonderful things about this series, and especially how much kids love them. Thus, I decided to give them a try. In retrospect, perhaps the title of the first book should have been a red flag, as we don’t usually allow our kids to say the word, stupid. But I didn’t want to judge a book by its title, and I do think there is wiggle room with language when it comes to books (and even movies). Part of teaching our kids about language, after all, is to impress on them that we don’t repeat everything we hear. Anyhow, I read the first book to the kids. They loved it. Then, I read the second book. They loved that one, too. Because I couldn’t do it anymore. It’s not just that Junie B. is selfish and hateful. After all, lots of kid-friendly characters are selfish; the world of Thomas the Tank Engine, for example, is filled with unpleasant, petty engines. What makes the Junie B. Jones series unique, though, is that everyone is selfish. At least Thomas and his friends have Sir Topham Hatt as the voice of reason; Junie B. is not so fortunate. Her parents and teacher hardly seem to care about her: they certainly don’t listen to her, and they never take the time to teach her anything. She basically acts like an untrained five year old, which is probably because no one takes the time to train her. In the first book, Junie B. is terrified of riding the bus, but all the adults dismiss her fears without addressing them, and then force her to ride it anyway. She is so scared to get back on the bus after school that she hides in the classroom. Never at any point does she ponder the deception of her scheme or worry about what her mom or teacher will think. Indeed, she never thinks about anything but her immediate desires. Again, that’s normal for a five year old, I guess. However, even at the end, everyone is exasperated with her, but no one takes the time to teach her why her actions were wrong. Which means that I then have to explain to my own children why Junie B’s behavior is not acceptable. In fact, throughout both the books, I had to stop repeatedly and ask my kids what they thought about Junie B’s current behavior. Then we would talk about why she was being selfish. To be honest, I really see the series as more of a satire of society…but my kids aren’t old enough to get satire. Instead, they just get a bad example of a five year old (and bad examples of parents and teachers). The books definitely didn’t scar my children or anything, but for me, they weren’t worth it. I figure my kids have enough bad examples around them without me spending hours providing them with yet another one through the books we read. If we read something, I want it to at least have a decent moral. And it’s okay if the moral is subtle. To me, even classics like Where the Wild Things Are or Ferdinand have decent morals, even though they are very understated. But I could find no moral in Junie B. Jones. So that’s where I stand on The Berenstain Bears and Junie B. Jones. If you are a parent (and even if you’re not), I’m interested in how you decide what books to read to your kids. Do you fall more into the didactic camp or the aesthetic camp? Do you think I am overreacting at either (or both) of these books? (After all, Greg said that this post mainly demonstrates how picky I am!) And have you found any books that are both well-written and at least somewhat instructive? Do a picky mom a favor, and pass those suggestions along! Kim, I read some BB books to our kids too, but found they weren’t on the same quality level as others like Ferdinand (one of my favorites!). I tended to read them books that were well written, and if they had become enamored by books less well written I’d read them those too. Great writing tends to teach; in fact, I don’t think it can help itself. My two favorites of all time are A Fly Went By (Mike McClintock) and Go, Dog, Go (P.D. Eastman). Whenever I’m invited into a classroom to read to kids (preschool to teens, doesn’t matter), these are the books I bring. You’ve probably already read them, but just in case not I’ll give you a rundown on them. I bet these are in your local library, but if you have to buy them I think you’ll find they are one of your best investments in building up your home library. Tim, we love Go, Dog, Go–although I never really thought too deeply about the evolving friendship between the two dogs (“And NOW do you like my hat?”). It’s nice to see someone who (over? )analyzes children’s books like I do (for example, I love Where the Wild Things Are, mainly because I think it traces the necessary childhood journey from Id-dominance to Ego-dominance. Sendak provides such a beautiful and poetic rendering of that process.) Also, I love Ferdinand, b/c I think my Luke has a bit of Ferdinand in him–a gentle giant:). I haven’t heard of A Fly Went By, so I’ll check it out. Thanks for the recommendation! Great insight on WtWTA, Kim. One reason I identify with Ferdinand is that I too have acted out of my usual character because something stung me. Every time I read Go, Dgo Go as a kid, I wanted to go to that dog party in that tree. Still do. Tim, I’ve been meaning to tell you that I reserved A Fly Went By at my local library. When it came, I read it to my kids, and they LOVED it! We have read it over and over since then. Also, I took it to Luke’s school today and read it to the kindergartners. Even though it is around sixty pages long, they were riveted by it! It’s so crazy that I had never heard of that book, as much as I loved books as a kid. Luke’s teacher had never heard of it, either, and she wrote the title down. All that to say, thanks for the rec! I am so glad you like AFWB. It’s my favorite kids book ever! We love Junie B. Jones! Sometimes I laugh so hard while reading them out loud that I have to take a break because the girls can’t understand me. And they love her too. I don’t mind that we have to talk about them and figure out our own moral lessons. I actually like that part. They think she’s funny because she often behaves so badly and it makes them feel good to be able to point out to me that Junie is being selfish or disrespectful or a bad listener (and on and on). I’ve also appreciated the opportunity to show them that grown-ups make mistakes too. They know firsthand what it’s like to want something from me while my attention is on the baby. And they know that I try to do my best. But it has been helpful for us to talk about how sometimes Junie B’s parents aren’t giving her enough time and attention and that a lot of the time the things she does that get her in trouble could have been avoided if her parents had just talked to her about her behavior beforehand or listened to her the first time. LOTS of teachable moments in there! =) And I agree with you about some of the BB. I guess I’d much rather take breaks during our reading to find the moral issues together than be hit over the head with them. Drea, First of all, I’m so glad that you provided a dissenting opinion! I was worried that I conveyed my feelings about JBJ too strongly, and I want to make clear that I think she is hilarious, too! Plus, I’ve only read two books. In the first one, I didn’t like her parents or her teacher. But in the second one, I really didn’t like her. Which is sad, b/c she is in kindergarten, and that probably makes me a LITTLE too judgmental:). Also, I like your point about kids being able to relate to Junie B. when it comes to not being listened to or not getting the attention they feel they need. I hadn’t thought of that. And I like how you take the time to have teachable moments. For me, the series ultimately wasn’t my cup of tea, but like I said, I don’t see it as a moral issue. Besides, I’m well aware that my preference for didacticism makes me a complete square in English circles (it’s almost as bad as using the word “square” as a slang term)! As a fellow English major, you know well, I’m sure, that mine is the minority opinion:). That said, I don’t like overly preachy books. The best morals are implied, if you ask me. Uncle John, I do think there is the option for entertainment, though I think that it would go under the umbrella of “aesthetic.” And we do definitely read books for entertainment at our house. One of our favorite genres is mysteries, and so the kids and I read Nate the Great, Scooby Doo chapter books, and Cam Jansen, among others. There are definitely no clear morals in most of them, and the characters don’t always do the right thing (just yesterday, in fact, I paused our reading to note that Shaggy should not have lied about looking for clues when he was really headed to the cooking demonstration:)). And like I mentioned in the post, part of understanding the world is to realize that you don’t imitate everything you see. Junie B. just crossed the line for me a bit. I only read two books, but so many parts actually made me SAD for the people involved. Which was weird b/c the books are supposed to be funny (and often are). But again, I’m certainly not judging others who get enjoyment from the series. I’m just interested in the discussion of children’s literature, as it has a big place in our house right now. And I was curious to see how it intersected with the idea of glorifying God for other people. It’s something I’m still trying to figure out myself. I am not a parent, but I do tend to have strong opinions about art & literature. I would say, in general, that both the aesthetic and the didactic have their place, but each needs to be done well. I think that we unconsciously look for morals in stories, so it makes me feel more comfortable when there is one (well, if I agree with it.) 🙂 However, when the moral is too “in your face,” that is a big turn off. It needs to be such that the reader can discover it for him/herself but in at least a slightly challenging way. (I feel this way about music too. I tend not to like overtly Christian music–except for actual hymns–because the overt-ness feels cheesy to me. It’s better when it’s slightly more vague and I can attach my own personal significance to it.) When there is no moral, I’m cool with that too, as long as there isn’t something negative that is being taught. I think that there is value in a book (or a piece of art or a song) simply taking you to another place and creating a different mood. It is good to let the imagination have some space to breathe and to create what it wants to create without having something already imposed on it. However, I have read some different children’s books that I really did think were (*ahem*) “stupid.” Not only did they have no [positive] moral but the characters acted in ways that I would think would be bad examples for children, such as telling lies, disrespecting authority, acting “zany,” etc. (BTW, I CAN’T STAND the zany humor that is prevalent in most cartoons these days. It’s no wonder children are bouncing off the walls. This is the example of “cool” that is presented to them.) I don’t have any good examples of actual books for you for that age range, but, for when your kids are a little older, the Chronicles of Narnia series is perfect. In my opinion, it successfully combines both the aesthetic and the didactic, leaving you with good morals AND the feeling that you have been to a really cool place. While “The Lion, the Witch, and the Wardrobe” is a classic and very, very good, I actually like some of the other books better. Also, I don’t care so much for the movies (they’re okay, but they don’t at all live up to the quality of the books), so don’t judge the series by them. Anyway, I think I agree with your thought processes on the books you mentioned. I think you are right to be picky. It makes sense to me that what they read at that age would greatly affect them. My impression is that there are many quality children’s books to chose from, so I wouldn’t even bother with the less than stellar ones. Becky, I’m dying to hear an example of what “zany” humor is! :) I need more specifics! Okay, I gotcha. Well, you will be relieved to know that there are tons of cartoons out now that are not zany at all–especially if you don’t have cable:). In fact, I find some of my kids’ favorites to be coma-inducing. They have grown out of Thomas the Tank Engine, for example, but I thought that the long tracking shots of miniature trains rumbling through both the countryside and mundane plots were incredibly dull. The kids, on the other hand, were enamored. Now, they watch Peep and the Big Wide World on Weet Woo (an iPhone app), and the whole cartoon consists of minimalist drawings and more dialogue than action. Mysteriously, my kids find it to be hilarious. Personally, I gravitate more toward shows like Franklin and Little Bear, which are both subdued and wonderful, with all the characters being decent to each other. Those shows used to be on a free network called Noggin, but I think it has changed its name now. Anyway, the point is, don’t worry. There will be plenty of good shows for your future kids to watch:). The most zany thing my kids watch is old Donald Duck episodes on Weet Woo. Just to clarify, I was not defending Junie B. Jones (not intentionally anyway) and it is not Jessica’s favorite series. The series was on her list of recommended reading material for school and she actually started reading it at school. She actually prefers non-fiction and biographies (most recently The Rosa Parks Story). Her favorite movie is Remember The Titans. So when she occasionally wants to read Junie B. it doesn’t concern me too much. Joseph has absolutely no interest in reading it; he thinks it’s silly. He’s like you, he loves a good mystery or problem solving book. They both started reading with their childrens Bibles. We read out of them more than any other book. Unfortunately, as they get older it’s harder and harder to get them to read anything. Yes, that is good to know. 🙂 Admittedly, I don’t spend much time at all watching kids’ shows. I am only commenting on what I have seen. I’m glad that there is, then, MORE than I have seen. Another great cartoon is Phineas and Ferb. Great writing, clever plots, captivating artwork/drawing, funy stuff. It’s like the Rocky and Buillwinkle show, with all of its constituent cartoons (Fractured Fairy Tales, etc. ).